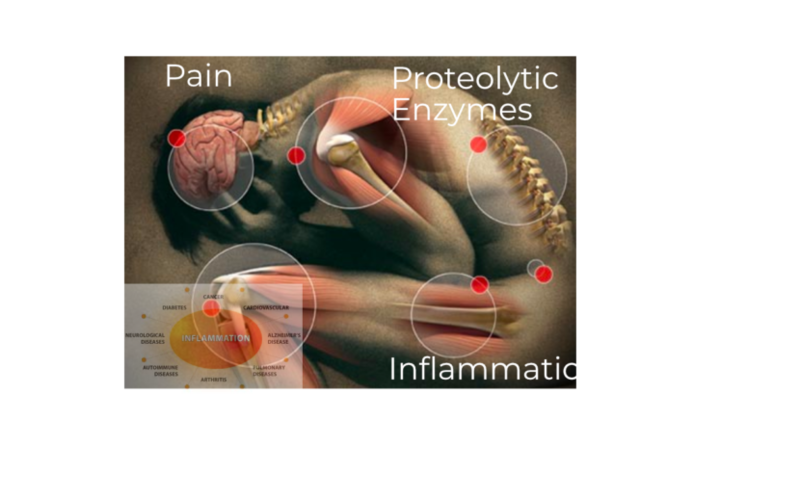 In addition to injury, Diet and Lifestyle factors are directly connected to inflammation, pain, and poor health. Causative factors include not only “Stress” but also Oxidative Stress, Injury, Bacterial/Viral Infections, Leaky Gut, Excessive Consumption of sugars and fats and diets poor in nutrition. The cascading effect of the causative factors result in decreased health, and localized and systemic pain and inflammation The most familiar options for treatment of Pain and Inflammation include acetaminophen, NSAIDs (aspirin, Motrin, Aleve) Steroids, Opioids, and COX-2 Inhibitors. The causative factors result in the activation of a protein complex NF-kappaB (NF-κB). The protein complex is key in DNAS transcription, cytokine production and survival of cells. It is found in most cell types and involved in cellular response to stress. NF-κB is instrumental in regulating immune response. Incorrect regulation has been linked to cancer, autoimmune diseases, septic shock and improper immune development. 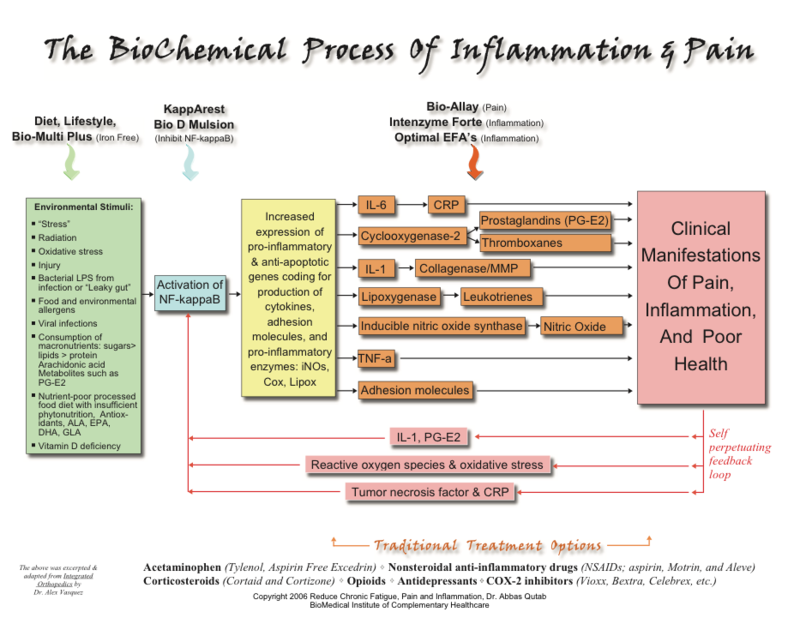 Other treatment approaches to systemic inflammation are food or plant based. Most familiar of these is the use of familiar herbs such as Curcumin (component in Tumeric). These are used in the reduction or prevention of inflammation from the inhibition of NF-κB. An added benefit of these inhibitors is they block the replication of viruses. Although multiple vitamins and supplements can be used for treating inflammation this journal entry will primarily emphasize vitamin D.
Vitamin D is a notable inhibitor to NF-κB activity within each cell and as a result it can be used to alleviate inflammation and the associated pain. Vitamin D levels tend to be overlooked in treatment and use for these areas. Vitamin D tends to be deficient in the diet and relates to chronic musculoskeletal pain4, being a deficiency it is treatable. Clinical improvement in pain studies was seen in all double-blind groups and in 95% of all study patients5. Studies in 2008 showed that the deficiency of vitamin D (actually more a hormone than a vitamin) leads to resistant chronic systemic inflammation and neuromuscular pain and dysfunction. Diets and activities or lifestyles associated with an increase in inflammation reduce the available quantities of vitamin D worsening conditions. Noted improvement in conditions focused on in clinical studies was observed when the values of vitamin D were supplemented with replacements6. 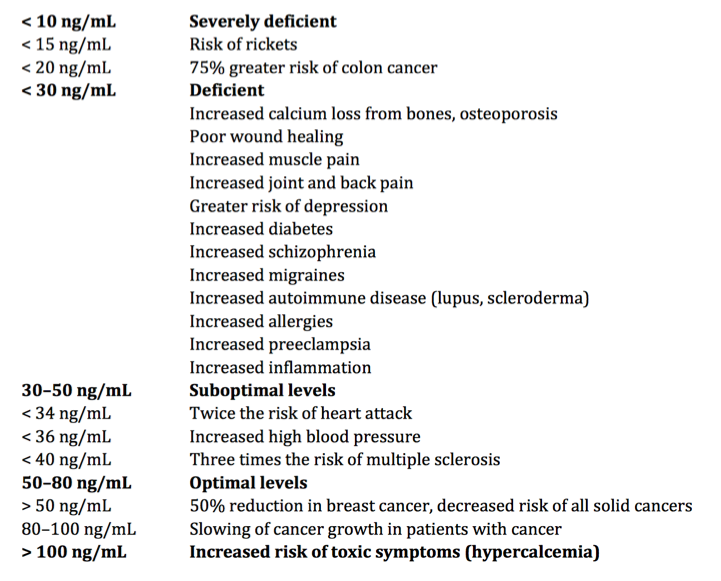 Studies of the levels of vitamin D have been seen related to specific conditions as illustrated in the following chart. Most vitamin D is produced in the skin when it is exposed to sunlight. The production levels depend upon several factors including extent of exposure (time and skin amount in the sun), age, skin pigmentation, etc. Exposure of the arms and legs will produce 10-15,00 units from one exposure. Use of SPF sunblock drastically curtails or prevents any vitamin D production. It is also important to remember that when taking vitamin D supplements adequate intake of both calcium and magnesium must be maintained. Before starting on any dietary supplement changes it is important to have discussions with your healthcare providers. Vitamin D deficiency causes chronic musculoskeletal pain, Mayo Clinic Proceedings Editorial. December 2003, V. 78 N. 12.